"The statement the fall of bodyboarding seems a bit inaccurate" says 2003 Hawaiian Pipe Champion and co-owner of No Friends clothing Jeff Hubbard, who reminds us that there are tens of thousands of people who bodyboard every day and that the bodyboard itself has only been around for about 30 years. He admits that while the sponsorships and opportunities to do it professionally are not what they used to be in the late 80s and early 90s, but claims that there are as many if not more bodyboarders in the water than ever before. The type of bodyboarder today, however seems to be much different from those who jumped on the boogie ban wagon 10 years ago. Back then, most perceived bodyboarders as young punks who raged in the surf with no respect for anyone. Today bodyboarders humbly hawk the line up positioning themselves into the places of the wave which are not welcome to stand up surfers and pushing the limits of bodyboarding to the point where even their biggest skeptics will shout a hoot to them in a tube. Gary Morihara innovated Yikes Bodyboards in 1991 and though he doesn't sell as many bodyboards these days, he enjoys bodyboarding as it now stands "stripped to it's essence" which is no longer driven by a"way of life defined by money." Reflecting back to the glory days however Gary explains the power and the momentum the sport had at that time saying, "You felt part of a new approach to surfing, a surfing revolution" Being both a stand up surfer and bodyboarder since 1967, he also makes the point that "much of the surf industry, were threatened by the status of standup surfing. Instead of viewing bodyboarding as a way to expand the market, an opportunity to invest & make money, some of the status quo were unmoved and not willing to share a piece of what they considered, was a small pie". Most bodyboarders would agree with Gary that the deterioration of the professional side of bodyboarding was caused by this threat to the surf industry and I would have to agree. One problem the surf industry faces is that you can't jump on a surfboard and be able to really rides waves during the length of a vacation, while on a bodyboard, you can. The marketability of the bodyboard being more user friendly is a double edged sword, suggests World Champion Karla Costa Taylor. "Our board is also a toy for kids" says Karla who explains how hard it is to promote the bodyboard as "fun for kids to play with", but then turn around and show that it is extreme, radical and sometimes deadly when used by professionals. For example, when most people hear the word bodyboard, they visualize a tourist going straight in 1/2 foot of shorebreak which makes it hard for them to understand that the same vehicle has taken professionals into the biggest narliest waves known to man. Though some draw conclusions that the tour events run in small surf did not substantiate the sport's true potential, bodyboarders pinpoint the media as most responsible for bodyboardings lack of exposure and therefore poor value for monetary support. "You just can't change people's mind unless there is a work in the media to change the wrong image the sport has", says Karla. Being a women, she brings attention to the fact that there were hardly any women stand up surfers until the media made it the thing to do, and now it is the next big thing. "You will always have people that are there for the image and people that really love the sport." concludes Karla who now truly understands the need for both, being that she has recently created a new bodyboarding label called Graphiccaffiene with her husband, extreme bodyboarder and artist Alistar Taylor. Retired Pro Bodyboarder and MBA Guin Allen shares a strong business perspective as to why this may have happened, "the "bossyboarders" became greedy and demanded too much money for their exposure and as a result, the media may have been turned off and as well as the sponsors. Turned off. Why else, would something with revenues as large enough to hold a world tour all of a sudden cut off its promoting budgets? Actually, I think the target markets were not penetrated appropriately and the surfing industry may have known this. " Both Guin and Karla notate the change from women's bodyboarding to women's surfing in the media. Women's bodyboarding which really took off in the mid- late 90s especially in countries like Japan and Brazil may have been the stepping stool that pushed women's stand-up surfing into the mainstream. The movie Blue Crush, which portrayed women surfers challenging Pipeline in a contest was only a reality to women bodyboarders who have had a contest there since 1986, but realistically they were also the only girls to really ride this dangerous wave with any kind of consistency. Rumors has it that the Blue Crush story was actually written up in Outside magazine by women bodyboarders which Hollywood changed into a women's surf story to keep up with the times and the trends. 10 years ago when women stand up surfers were not perceived to be feminine enough to market women's products, bodyboarding beauties were seen in advertisements for everything from wetsuits to Cheerios boxes. Guin expresses that the exchange was due to trend setting which is common in marketing and that women's surfing has replaced women's bodyboarding as the new flavor for women in the water. She also feels that with bodyboarding threatening sales from the surf industry, it does not have much chance to make a rebound, but thinks that if Japan's economy and interest were to relapse on bodyboarding, that might be the hope which sparks the future of the sport professionally. Whether or not bodyboarding can ever make a comeback doesn't make much difference for 39 year old Brazilian bodyboarder,Claudia Ferrari who states "I achieved the most important things of my life with it". Noted as the first true women's world champion of bodyboarding, Claudia was able to obtain an athletic visa so she could keep living and surfing her favorite waves on the Northshore permanently. Besides keeping her healty and happy, the world wide recognition she gained traveling on tour has done wonders for her web business which tells the daily surf report and everything you need to know about bodyboarding. In the past year she began selling Hawaiian gifts online and has had great success, even allowing her to quit the day job. Claudia is very passionate about selling what she calls "pieces of paradise" especially to her international customers who may never get a chance to visit the islands. Claudia, who says Hawaii welcomed her with open arms is compelled to share this Aloha Spriit with the world. As the men, women tell how bodyboarding gives them the ability to fully enjoy their love of the ocean, but if they are from the old school you can be sure they are fiesty enough to let you know bodyboarding is responsible for their world famous butts. They also rate bodyboarding as a better workout for women than standup surfing because it works all the areas of the body instead of an overemphasis of the shoulders. Guin brings to attention that with bodyboarding you use your whole body to manuver the board which gives women a better chance for control and coordination especially in big waves. In recent years several world class bodyboarders have traded in their bodyboards for surfboards and proved that they are not to be underestimated as watermen and women. Though most surf casually, guys like Kainoa Mcgee got competitive and made it as far as the semi finals in some of the largest surf ever run in the HIC event at Pipeline. Kainoa remains a threat to any stand up surfer in a surf spot that has enough power for him to punch. Snobby women surfing wannabes began taking to the line ups on 1-4 ft days at Pipe which provoked local bodyboarder Emilia Perry to grab a surfboard and mingle. Almost mockingly, she was able hold her on with any of them and once the surf began to rise they would go in, she would get her bodyboard, smile and then return to the surf. Soon after Emilias little joke became her challenge and she now stands not only one of the few women to bodyboard substantial Pipe, but one of even fewer women to stand up surf it. Mike Stewart, who has one of the most successful careers and names in the bodyboarding business, has recently discovered an even more lucrative side of bodyboarding. Big Movie Productions will often pay Mike to mount a film camera on his board and film one of his prestigious Pipe rides up close or use his water skills to shoot the stunt doubles. With Hollywood on his side, he doesn't have to worry about the status of professional bodyboarding anymore to say the least. At times some bodyboarding veterans struggle with feelings that all their hard work organizing the tour, promoting the sport and perpetuating the progress of it has all been in vain, but not one person I spoke to in this interview said that lack of money or fame changed their passion or willingness to bodyboard. Purely a stand up surfer myself, I am often in awe of the bodyboarders. Unlike many surfers these days whose whole motivation is fame and money, bodyboarders are the true soul surfers. They paddle out to monstrous Pipe religiously before the sun comes up, get some of the most unbelievable tuberides you've ever seen and photographers often won't even waste their film on bodyboarding photos they can't sell. They are the underground, the ones who live the life of a struggling artist whose painting is a wave. They follow their dream and do whatever it takes to make it happen. 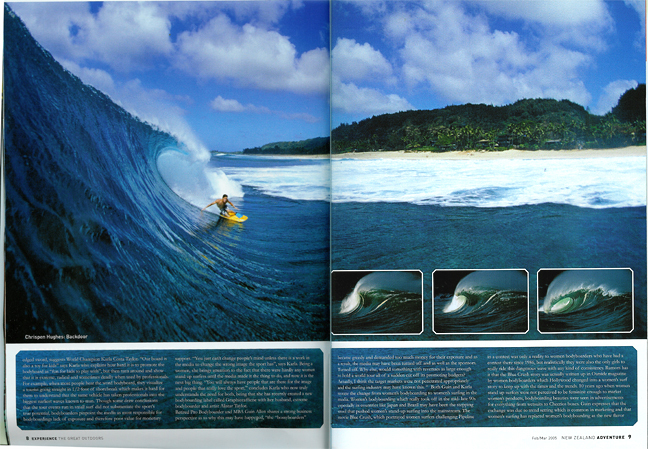 If its true that all things go in cycles, there should some day be a relapse of bodyboarding onto the mainstream. If Jeff Hubbard calls it right it will start on an international level where bodyboarding seems to be getting a serge of interest at the moment. None the less, todays unsung heros of bodyboarding are the roots to a strong foundation which was not there in the past. They have shown that their sport can survive considerable confrontation, yet still grow and truly live.